I expected to love The Drowning Eyes, but I’m sad to say I only liked it. The gorgeous cover art and the book’s description had me very excited about it, but it just wasn’t quite what I expected. 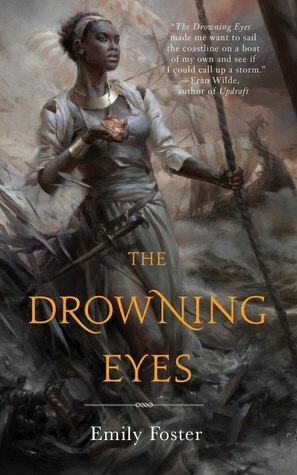 In spite of the way the book description reads, The Drowning Eyes is told almost entirely from Tazir’s point of view. I had expected it to be more equally split between Tazir and Shina, so this was a disappointment. Worse, Shina’s viewpoint was utilized suboptimally in addition to simply being underused; while it did offer a point of view through which the reader is given some extra information, mostly about Shina herself, there’s just not enough of it, and Tazir’s stronger personality is much more interesting and entertaining to read. Instead of being a good complement to Tazir’s sections, Shina’s brief POV scenes ended up being a somewhat irritating distraction from the real meat of the story. I also thought there would be more swashbuckling adventure. Disappointingly, there was basically none. This was largely made up for by Shina’s actually really fascinating weather magic and the accompanying sort of religious order that she’s part of, but still. I feel like I was promised pirates, and all I received was the rather mysterious Dragon Ships, which are never really explained very well and aren’t actually that big a threat to the characters over the course of the journey described in the book. This also has the effect of making it feel throughout the book as if we’re being told over and over again how high the stakes are without it being backed up by any action that the reader is privy to. It’s a problem, particularly when the personal stakes are plenty high enough to carry the story all on its own. Shina’s trauma could have been handled better and given a little more page space, and I would have loved to see more interaction with Shina and Tazir regarding Shina’s decision to give up her eyes. I love the whole idea of this practice, personally; all the best magic systems have heavy costs for power, and this is one that deserves to be explored more than it was. Tazir in general is a fascinating example of a type of female character that doesn’t usually get to exist—a somewhat grizzled, world-weary, and slightly misanthropic sea captain. I would read a dozen books about her adventures is Emily Foster would just write them. The supporting characters of Kodin and Chaqal are somewhere between underdeveloped and superfluous—especially Kodin—but this is something that, again, could be helped by just a couple more pages dedicated to each of them. Where things really fell apart for me in this book was the abrupt ending to Shina’s quest and the disorienting shift five years into the future. Frankly, I just don’t care for it, and I would rather have seen Shina’s search for the idol wrapped up a little more neatly. The break between Chaqal and Tazir and then the one between Tazir and Kodin could have still been handled similarly, but closer to the events that actually precipitated these changes in the characters’ relationships. I suppose there’s something to be said for capturing the messiness of human relationships or something, but I would rather read a story that shows things happening instead of reminisces on them years after the fact. Even with my criticisms of it taken into account, The Drowning Eyes is a wildly enjoyable novella. It’s full of a lot of things that I love in fantasy, and I sincerely hope that it’s part of some larger fantasy setting that we’re only just being introduced to. Probably the biggest issue I have with this novella is that it feels very much as if it’s only a part of something much larger, and I feel frustrated at not having that something larger in my hands to read right now.